You’ll need to set up a temporary kitchen. That could be in the dining room, living room or even out in the garage. What you’ll need for that temporary kitchen depends a lot on what you can do without. For instance, you might be able to relocate your refrigerator for the duration of the remodel in another room. You just might have to do without the icemaker hook up. A smaller kitchen can be set up on a spare table using just a microwave, coffee maker and Crockpot. As for all your pantry items, you might want to sort them in plastic storage bins for the duration. You might not realize how often you use your sink until the water is cut off. If you have a utility sink in a mudroom or basement, then you could certainly adapt that. A bathtub can also work but that can become a bit cumbersome. The most effective alternative is to switch to plastic and paper utensils. Yes, you will be rough in it for a few weeks. There’s going to be a lot of dust and noise created during the remodeling work. 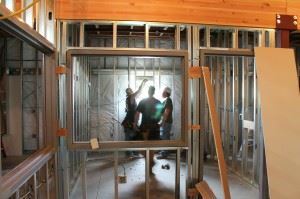 It’s a good idea to ask your contractor to hang plastic walls separating the work area for the rest of the house. That should keep the dust from spreading. You could go on vacation while the remodeling work is underway. Time it right and you’ll return to a finish kitchen. Short of that, you could also rent an RV and simply park it in the driveway. This isn’t so much a tip for surviving your kitchen remodel but cutting corners. The money you could save on a crew day could go towards a new stainless steel refrigerator or oven. You could do your own demolition with a little help from some friends. Junk King Birmingham is a perfect partner for this endeavor. They’ll be able to send out a crew and truck that will clear up all that construction waste that you create. That’s very important because you want the professional crew to have a clean site and you want to remove the hazardous materials immediately. You can survive your kitchen remodel with a little planning and a little help from Junk King Birmingham. This entry was posted in Birmingham Junk Removal and tagged construction waste, demolition, Junk King Birmingham, junk removal, kitchen remodel on June 30, 2017 by Junk King. Last updated June 30, 2017 .